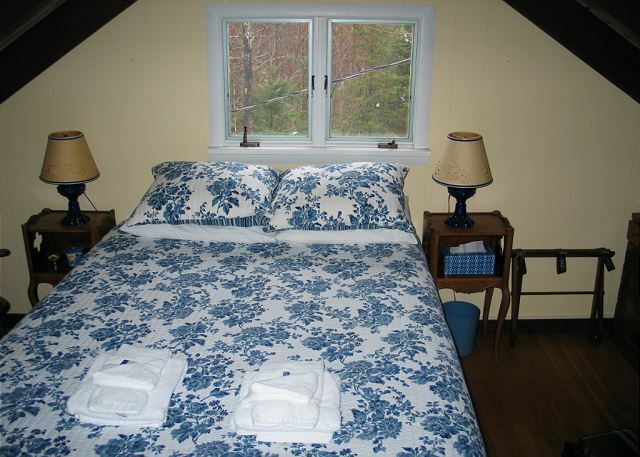 The Holiday Chalet is aptly named, and perhaps even better located, as it lies so close to Franconia Notch. 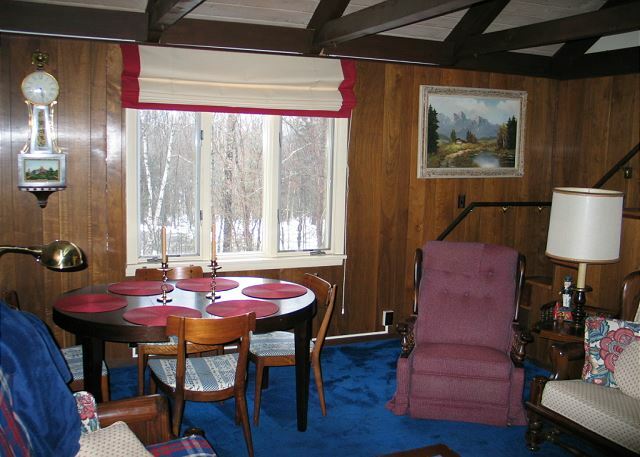 The Holiday Chalet has 3 separate levels, 3 bedrooms, and 1.5 baths. 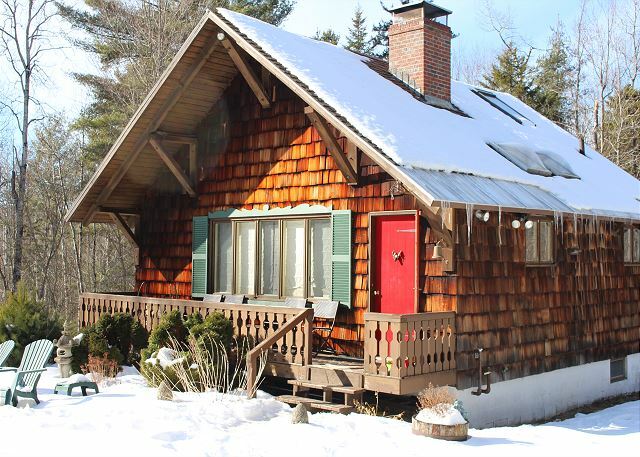 Draped in it's Winter coat, the Franconia Holiday Chalet is just minutes from Cannon Mountain! 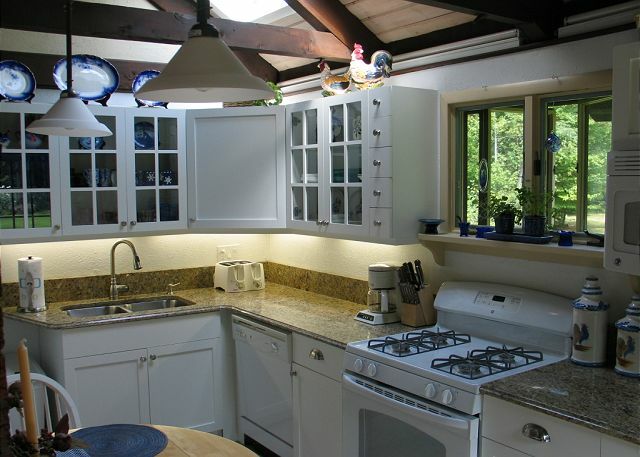 The beautifully simple and bright white kitchen area is fully equipped with all your needs! Additional view of the kitchen. The combined living and dining areas offer ample, comfortable seating. Bedroom #1, top floor, features a queen bed and extra privacy. Bedroom #2, main floor, features a queen size bed. Bedroom #3, main floor, features 2 twin beds. The full main floor bathroom, located between bedrooms #2 and #3. Pictured here is the lowest level of the home. 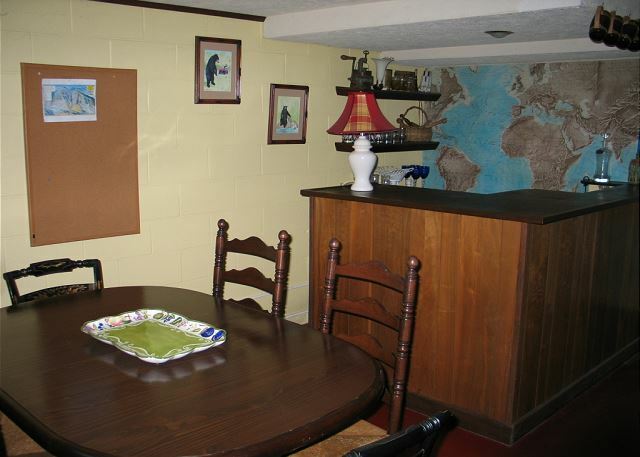 It features a second living and dining area as well as a wet bar. Lower level dining area and wet bar. The lower living area, equipped with TV/DVD player. 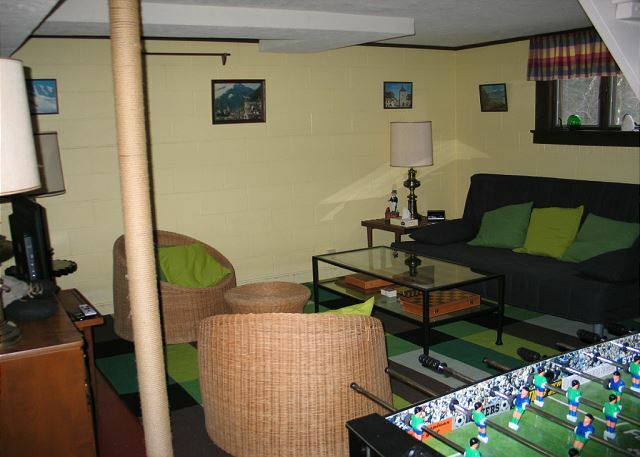 As seen here, the lower level also holds a foos ball table for extra family fun. Additional view of the lower living area. 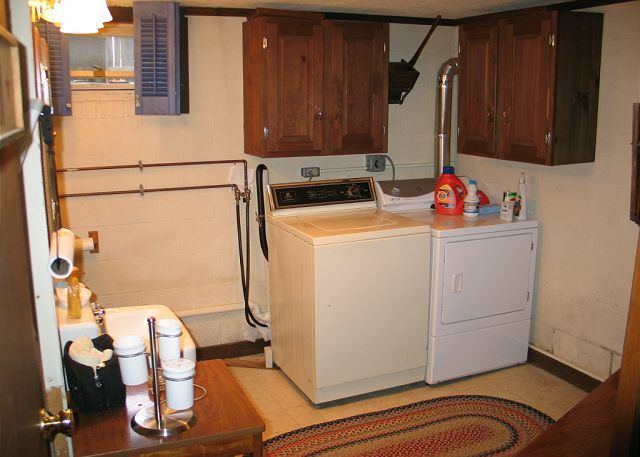 The lower level 1/2 bath also houses the washer and dryer, as well as a desk area for when you need to mix business with pleasure during your Franconia Notch vacation. 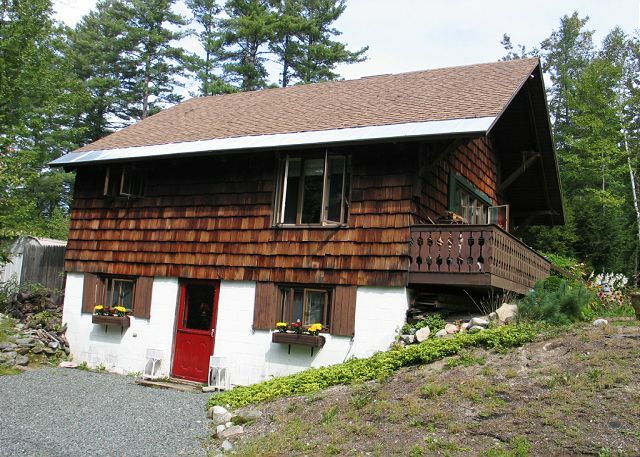 The Franconia Holiday Chalet is most convenient to both Franconia Notch State Park & Cannon Mountain Ski Area, as well as I-93, making getting to the house after a long drive easy, and getting to the mountains in the morning even easier. One of Franconia's closest actually... This 3 bedroom, 1.5 bath home is ideal for a family or group of up to 6 guests, offering 2 queen size bedrooms, plus a third with 2 twin beds. The kitchen is sure to please the fussiest of clean folks, while also pleasing the best of chefs. 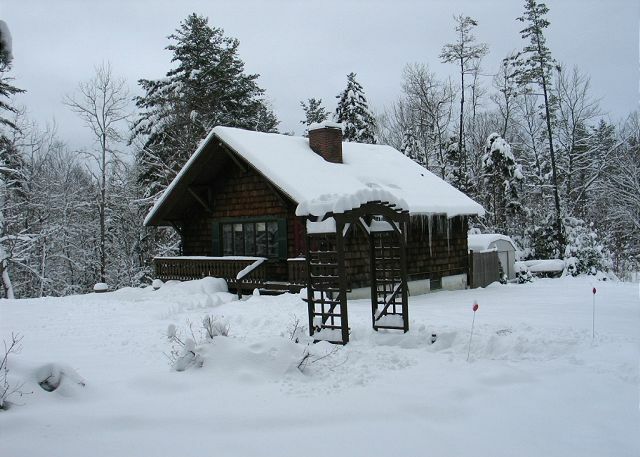 Built with family, skiing, and White Mountain fun in mind, walk out the door and you are almost immediately in Franconia Notch State Park... so be it downhill or cross-country, Summer or Winter, it all comes easy at The Franconia Holiday Chalet, a professionally managed Franconia Notch Vacations home. We came back to the Chalet and it was wonderful again! Great location, big space, super cute. Thank you for the points review Mr. Larsson, however it has left us to wonder in what way does the property condition only meet a "3" point score. The more we have to understand the better we can serve your expectation. Please do not hesitate to call us for any specific info or question you might have about this, or any of our Franconia Notch Vacations professionals managed vacation homes, as it is our pleasure to assist and ensure you of yours. Thank you for the points review Mr. Larsson, however it has left us to wonder in what way does the property condition only meet a "3" point score. For the more we have to understand the better we can serve your expectation. 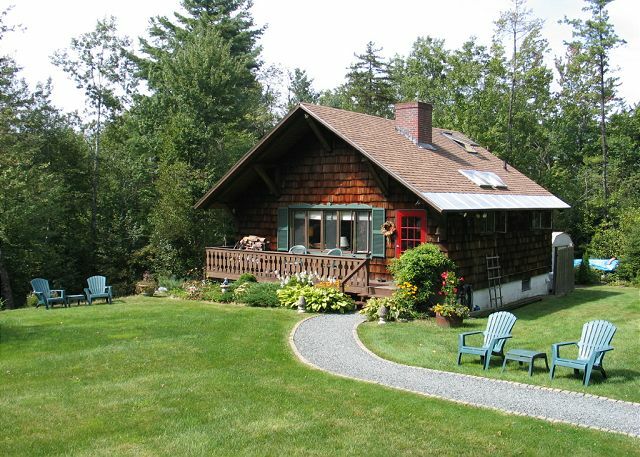 Please do not hesitate to call us at "Franconia Notch Vacations" for any specific info or question you might have about this, or any of our Franconia Notch Vacations professionals managed vacation homes, as it is our pleasure to assist and ensure you of yours. AS a family with four small children, this house was an ideal vacation house because of the safety location and clean environment. Plus we are from Japan and Iraq, living in Louisiana, having to spent our days in up north was so excited. I love this part of America more now. It must be so beautiful in the wintertime. I would love to come back and let our children to see the snow. It was the most beautiful summer vacation I have ever spent with my children so far. Thank you very much. It took so long to get here from down south but it definitely worth it! We spent a ski weekend here. We thought there would be four kids, but it turned out to be all five of them. Our four-year-old slept on the couch. 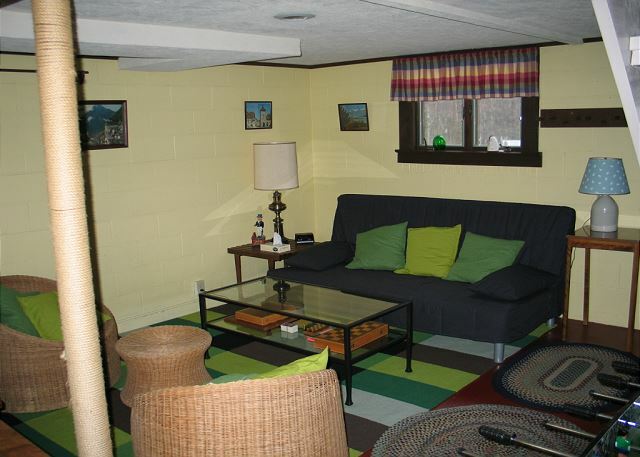 There is more space in the basement, if you had to spread out more, along with the foosball table, and plenty of space for boots, skis and snowpants by the back door. The kitchen has not one but two fine kitchen knives and two wood chopping boards. Pots and pans all in great shape, and dishwasher is quiet. The heating is effective and quiet. The plumbing is quiet. The beds are comfortable. We all slept well. The shower is great too. Lots of hot water. Next time we go to Cannon, which is less than two miles away, we hope to stay in this house again. We had a wonderful time for 3 weeks and we definitely plan to come back! 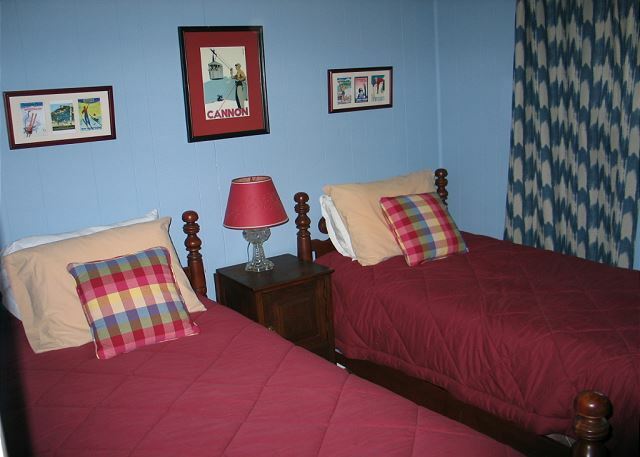 The chalet is conveniently located only minutes away from attractions, hiking, lake. The property is absolutely cute and we had everything we needed and more! The front yard and backyard/barbecue area are much bigger than they look in pictures. two day ski trip with nursing buddies from Vermont and New Hampshire was just what we needed for our well-earned mini-vacation to Cannon Mtn. Everything we needed was there to help us enjoy several yummy meals. This is a very well maintained home in a great location. Perfect for smaller families. The only small drawbacks would be that the heat can be a bit squirrely and the water filter needed to be changed twice during a four-month stay of mostly weekend use. Overall, a great place and good value.